This deck uses cards with [Blocker] and [Counter] to defend against your opponent’s attacks, then looks for openings to sneak powerful Battle Cards onto the playfield and win the game. [BT1-086 Golden Frieza, the Resurrected Terror] and [BT1-090 Mecha-Frieza, The Returning Terror] can seal the deal in a pinch, with powerful skills your opponent won’t have answers for. 1.Play cards with [Blocker] to fortify your late-game defenses. 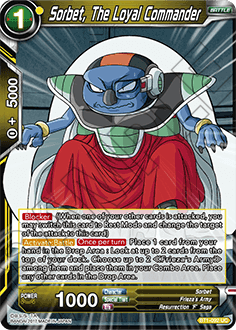 Your first step is to play cards with [Blocker] like [BT1-092 Sorbet, the Loyal Commander] and [BT1-089 Ginyu Force Guldo] to prepare for your opponent’s attacks later in the game. Sorbet can help create big combos in a pinch, making him useful for offense and defense alike. His skill is dependent on luck and can drain the cards in your hand, though, so be careful. 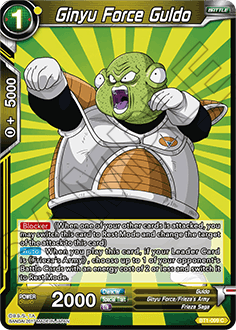 [BT1-089 Ginyu Force Guldo] puts your opponent’s low-cost Battle Cards into Rest Mode. If you can put your opponent’s Battle Cards into Rest Mode, KO’ing them before they can Evolve will become considerably easier. 2.Create an opening, then attack with powerful Battle Cards. Once you have cards with [Blocker] and [Counter] to defend against your opponent’s attacks, it’s time to play powerful Battle Cards. 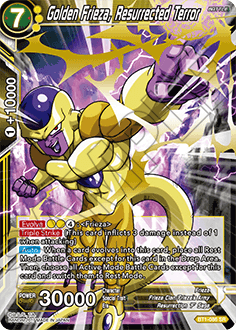 Use [BT1-086 Golden Frieza, The Resurrected Terror] and [BT1-090 Mecha-Frieza, The Returning Terror] to clean up your opponent’s Battle Cards and dish out damage to their life totals. Both cards can easily wipe out Battle Cards in Rest Mode, pushing the pace of the game in your favor after your opponent attacks. They also both have [Strike] skills, shaving down your opponent’s life total in a flash. Don’t hesitate to use cards with [Blocker] and [Counter] during the late game to defend against your opponent’s attacks. 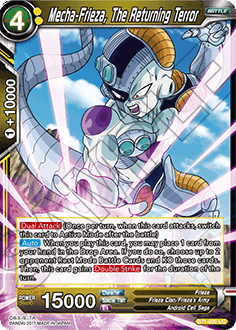 [BT1-089 Avenging Frieza]’s skill can help you amass cards with [Blocker], while the Leader Card [BT1-083 Frieza] can refresh your energy to help you pay for cards with [Counter]. You can also fill up your hand with Sorbet and Guldo’s ability to search for <Frieza’s Army> cards. And since they’re all low-cost, it’s easy to play them. 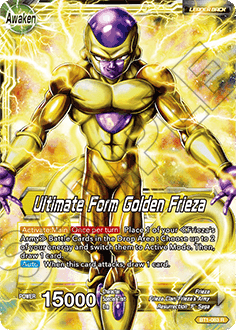 Ultimate Form Golden Frieza exacts a heavy cost, but his effect is incredibly powerful. Use cards like [BT1-102 Appule] and [BT1-103 Sui] to pay for the skill’s cost, and you can deal damage to your opponent while freeing up energy to use [Counter] cards during their turn.